It’s been almost four months since the NCM when Charrandas Persaud became a “Judas”, according to the State-owned Chronic. The AFC MP, as we all know, said he voted for the motion because he was fed up with his Government’s treatment of the Berbice constituency he represented. Especially the 4000+ sugar workers his party had betrayed when they uttered not a word after the PNC had unilaterally fired them and thrown them into the streets. He lived among those sugar workers in Canje. The PNC, not surprisingly in view of their history, couldn’t believe anyone could act on principles and accused the PPP of “bribing” Persaud. Bold talk of money being transferred to the MP in some named hotel over in T&T was floated but nothing came of that. AFC’s Ramjattan and Minister of Security then said he’d received a screen shot of a call from Persaud to a gold miner from Minister of Indigenous Affairs, Sydney Allicock, inquiring to purchase gold. Obviously stung by the criticism from the PNC that the “betrayal” came from their ranks, Ramjattan immediately took 2 and 2 and made 5 (under the new Maths!) that this meant Persaud was using his “bribe” money to purchase gold!! And passed it on to the Commissioner of Police (CoP) .Nagamootoo and others fuelled the fire against Persaud, as they struggled to prove their loyalty. The CoP promised he was launching an immediate investigation into this “lead”. Now the CoP is directly under the remit of Minister Ramjattan – who, in fact, is the person who recommends who gets the Co job. Now even though we know, in this particular selection, Ramjattan was sidelined, surely it strains credulity for the CoP to now announce he wasn’t “instructed” to investigate the “gold” story – but was only “informed” by his boss!! C’mon now!! Is Ramjattan, the Public Security Minister just an ordinary street snitch?? Why didn’t Minister Allicock pass on the screen shot directly to the CoP?? Because, dear reader, he knew that coming from Ramjattan, the “tip” carried much more weight. And the line between “inform” and “instruct” is a very thin one when your boss assures you a bribe was passed!! Charrandas, offered a quite plausible explanation for the inquiry on the gold purchase from the miner – that he was doing it on behalf of an overseas client. 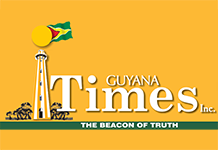 All Guyanese know that many overseas Guyanese routinely purchase “Guyana gold”. Persaud has in fact sued Ramjattan for libel. But most disturbing is the fact that the Police is still pursuing what is clearly a red herring across the trail of the Government’s defeat by the PPP in the National Assembly. Shouldn’t the Police instead wrap up the SOCU scandal?? Moving from allegations of bribery against Charrandas Persaud by his Minister, the CoP deftly moved on to the more substantial matter of bribery in the Force under his command. And your Eyewitness notes that this might be part of the reason why the “FORCE” hasn’t yet been transmuted into a “Service” – as was promised for years. After all, Police demanding bribes from the populace has now practically become a cottage industry and this can only be sustained when folks still perceive them as a “Force”!! You don’t expect that an institution that’s actually “serving” you will shake you down, do you?? And this highlights the disjunct between the CoP’s caution to citizens not to OFFER bribes to the Police. From this Eyewitness’ experience, it’s invariably the Police DEMANDING a raise – starting from a “fried rice” to a “Granger” ($5000) and beyond!! Whaddya do when you’re trying to get to work on time, and the Cop demands you follow him back to the station (for crossing the yellow line!). Or give him a Granger?? Your Eyewitness thinks the CoP should start the transition to “Service” by issuing SOPs on how his Police talk to citizens. How about a “Please”, or “Good day, Ma’am”? Or, “Thank you, sir” when stopping drivers to ask for “papers”? ?